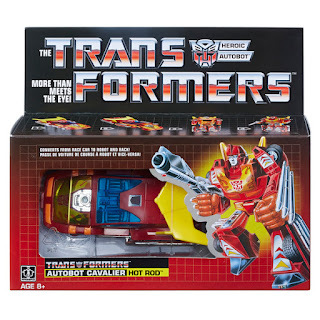 Walmart has put up a listing for the Hot Rod reissue I previously talked about. It looks like there is some minor color differences in his stickers, which I think is a neat way to differentiate this release from the prior releases and honestly, can I be real here for a second? I'm super excited to buy this guy. Sure, I already have a Hot Rod... but... look man, there's just something awesome about buying G1 Transformers at Walmart again. I'm going to walk in (or Walton in), grab a Hot Rod and maybe a pair of cargo shorts. Because it's summer. I also like to put my phone in the cargo pocket. It's convenient. Then I'm going to post all sorts of pictures of him, but not my cargo shorts. I don't think Instagram cares about those as much as I do.